Home » About » Blog » The Battle Against Lung Cancer Has a New Weapon: Immunotherapy. By harnessing the patient’s own immune system to counterattack lung cancer cells, immunotherapy medications are a revolutionary new approach to treating this disease. Lung cancer is the second most common cancer in the U.S. and by far the leading cause of death, according to the American Cancer Society (ACS). Immunotherapy holds hope for effective long term treatment of lung cancers that have advanced and spread to other parts of the body or for patients whose disease is not responding to other treatments. Fox Chase oncologists have been at the forefront of clinical research into the various immunotherapy medications that have recently received Food and Drug Administration (FDA) approval for use with non-small cell lung cancer. Also under investigation are other drugs and combination therapies that hold promise for more lung cancer patients, including those with small cell lung cancer, which is a less common condition. There are currently several FDA-approved immunotherapy drugs that target tumors showing markers for the protein PD-L1. This protein prevents the immune system’s T cells from recognizing and attacking inflamed tissues and cancer cells. The medications are also called “checkpoint inhibitors” because the proteins mimic the “checkpoints” that keep normal cells from being attacked by the immune system. All of these checkpoint inhibitors are now being combined with various drugs to improve the efficacy of these drugs. The most successful strategy so far has been the combination of a checkpoint inhibitor plus chemotherapy. 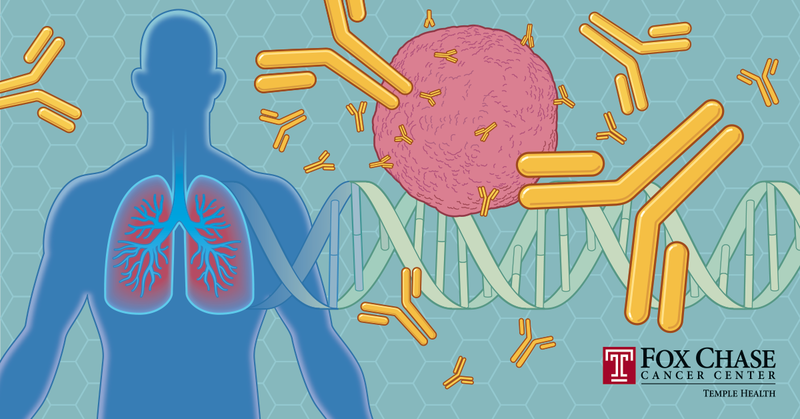 Assessing immunotherapy options starts with a tissue sample (biopsy) to do a molecular analysis of the lung tumor to see if the particular kind of cells may respond to targeted therapies first. The tumor sample is also examined for expression of PD-L1 to see if it can respond to immunotherapy. Treatment is given over about two years. Dr. Borghaei says ongoing research will show whether the timeline can be shortened while maintaining effectiveness. Finally, CT imaging studies track treatment effectiveness by measuring tumor size over time and identifying new lesions if they develop. Throughout the process, a multidisciplinary team of Fox Chase specialists from oncology, radiology, surgery, and other disciplines meets weekly to review the patient’s treatment response and provide additional services as needed. As with any therapy, patients may experience side effects. Because immunotherapy activates the immune system, about 10 to 15 percent of patients experience an autoimmune response, in which the immune system indiscriminately attacks normal tissue such as the lung or the colon. Patients are treated with anti-inflammatory medications such as steroids until the side effect recedes. As research continues and more patients receive FDA-approved treatments, the number of patients who benefit from immunotherapy is expected to improve. “About 15 to 20 percent of patients who qualified for treatment are showing long-term survival beyond two to three years,” says Dr. Borghaei. Researchers at Fox Chase and elsewhere are constantly discovering new ways to harness the immune system’s power, and new treatment options are being developed and approved. Finding and being treated at a cancer center that remains up-to-date with the latest research is one of the best tips that a patient diagnosed with lung cancer can follow.